Do Wearable Devices Connect People to the Internet of Things? User interface, convenience, and privacy concerns prevent people from using their wearable devices as part of the "internet of things" (IoT), or an ecosystem of connected devices. Instead, people primarily use wearable devices for "legacy" tasks, namely fitness tracking and checking the time. Wearable devices are the most visible consumer internet of things (IoT) technology. IoT refers to electronic devices that can be connected through internet networks. Wearable devices connect people to the “internet of things” through direct contact with your body – on a wrist with smartwatches and fitness trackers or on a face with smart glasses and virtual reality (VR) headsets. 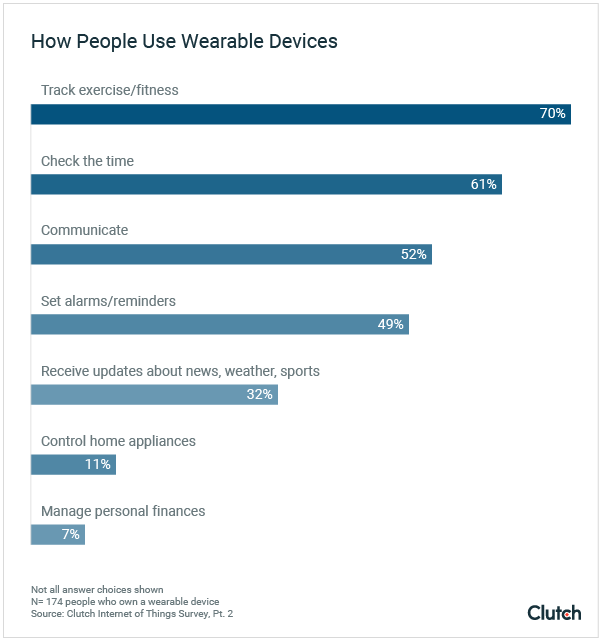 Clutch surveyed over 500 people who own connected devices to learn how they interact with popular consumer IoT technologies. Our first report in a three-part series about this data focused on which IoT devices people own and how they use them. We found that nearly all people who own a wearable device, such as a smartwatch or fitness tracker, connect them to their smartphones, but use their wearable for just a few core functions. Since people use wearables for select, limited tasks, wearable devices do not motivate owners to invest in other IoT devices. Businesses and developers involved with wearable technology can use our data to understand why people limit how they use their wearable devices. Just over one-third of people (35%) own a wearable device. People who own wearable devices don’t use them as often as other IoT devices. Only 23% of people use a wearable compared the most to other connected devices. Smartwatches (61%) are the most common wearable devices people own, ahead of fitness trackers (27%). Apple Watch (41%) is the most common wearable product people own, ahead of Fitbit (35%) and Samsung (21%) products. Half of wearables owners (50%) recognize that their personal data is shared across multiple connected devices. Nearly all people who own wearables (91%) connect them to their smartphones. Only 6% of people who own wearables, however, connect them to the same apps as their other connected devices, indicating they don’t use wearables as part a fully connected ecosystem of IoT devices. Wearable devices are the second-most popular connected devices that people own. Thirty-five percent (35%) of people own a wearable device, such as an Apple Watch or Fitbit. 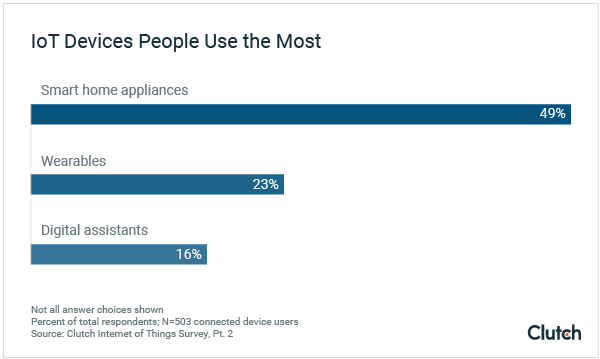 By comparison, nearly twice the number of people own a smart home appliance (67%), the first-place connected device. People purchase wearable devices with the intent to use them for select reasons, mostly fitness tracking. By contrast, people often purchase smart home appliances without realizing the product is a connected device, according to Rob Pope, CTO and Co-Founder of Dogtown Media, a mobile app development company based in Venice Beach, California. Smart home appliances are sometimes the only option for consumers to choose, as is the case with smart TVs. There are a variety of smart appliances on the market for people to buy, which explains why more people own them. On the other hand, people who own a wearable device don’t need to own multiple: Owning both a smartwatch and fitness tracker, for example, would be redundant. People primarily own wearable devices that can be worn on their wrists. Smartwatches (60%) and fitness trackers (27%) are by far the most common wearables people own. People’s preference for smartwatches and fitness trackers corresponds to the most popular brands in the wearables market. Apple has the most popular wearable device, according to our findings. The largest number of survey respondents indicated that they own an Apple Watch (41%). Just over one-third of people own a Fitbit (35%), and 21% own a Samsung wearable device. An expansive platform: Wearable developers are familiar with the iOS platform, which makes it easier for them to develop applications for wearable devices. This results in more applications for consumers to choose from. A familiar application market: People are familiar with the App Store, which makes it easy to purchase a wearable device and immediately download applications. Existing Apple users: Apple Watches are naturally compatible with iPhones, which are the most popular tech product in the United States. This creates a built-in market for Apple’s wearable products. A luxury brand: Apple is perceived as a luxury brand, giving it positive cultural associations. Apple’s technological and cultural advantages help it achieve success in the wearables market. People who own wearables use other IoT devices more often. Only 23% of people who own connected devices use wearable devices the most, compared to approximately half (49%) who use smart home appliances the most. Sixteen percent (16%) of connected device owners use a digital assistant such as an Amazon Echo or Google Home the most, which is marginally less than the number of people who own wearables. 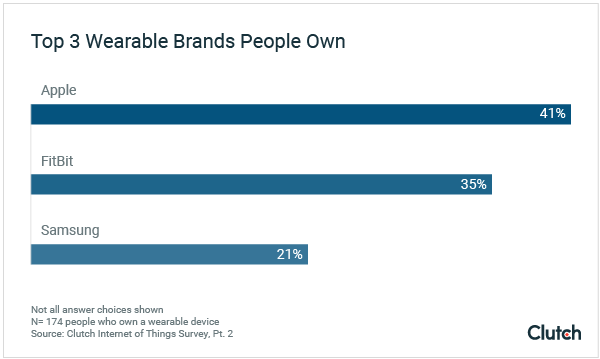 Even among wearables owners, just two-thirds (66%) use their wearable devices the most compared with other connected devices they own. The tasks people use their wearable devices to accomplish do not require them to use their devices constantly, which allows them to use other connected devices more frequently. People use their wearable devices to accomplish simple, and few, tasks. The primary reasons people use wearable devices are to track exercise or fitness (70%) and check the time (61%). People also use their wearable devices to communicate (52%), set alarms or reminders (49%), and get updates about the news (32%). How people use wearable devices indicates that they purchase wearables to accomplish “legacy” tasks, or tasks they can accomplish without a connected device. "Most people get wearable devices for a specific function rather than for the motivation to linking up to the internet of things,” said Nate Masterson, who owns and uses a wearable device and is chief marketing officer of Maple Holistics, a personal care company. People use their wearable devices to accomplish specific, relatively non-complex tasks, rather than connect people to other devices or technologies. People do not use their wearable devices for complex tasks such as controlling home appliances or managing their personal finances. Only 11% and 7% of respondents use their wearable devices for these tasks, respectively. The screens on most wearable devices limit their functionality beyond simple tasks such as fitness tracking. The limited functionality is particularly evident for tasks that involve complex user interaction such as clicking through multiple screens. For example, using a wearable device to browse real estate listings or check a bank account does not provide the same comprehensive experience as using a desktop or smartphone interface. 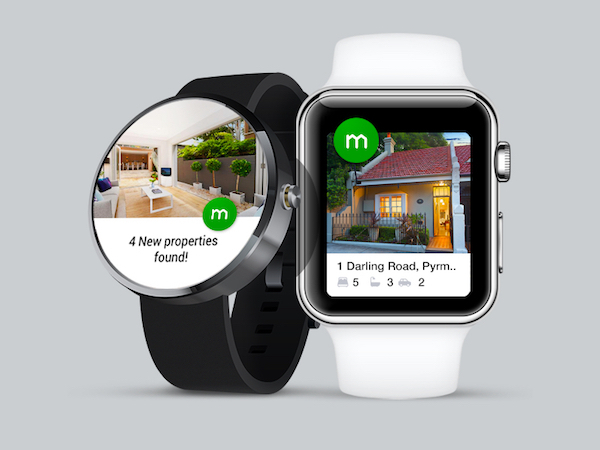 Domain Creative, an Australian real estate company, developed a wearables application that allowed users to scroll through property listings. While its wearable app allows people to access prices, addresses, and photos, people have to click through multiple screens to get this information. Computer or mobile device interfaces, on the other hand, allow users to access the same information on a single screen. The extra steps users take on wearable applications are a significant user experience (UX) barrier and have been for some time. Clutch research from 2016 indicates that about half of wearable app developers struggled with limited functionalities on wearable interfaces. The functionality limitations that developers experience are passed on to users through the wearable applications they download. Over time, these limitations have negatively impacted the number of people who choose to download wearable applications, especially applications that involve complex interaction. Ultimately, the limitations of wearable interfaces provide little incentive for owners and developers to continue to invest in wearable technology and applications. People still prefer to accomplish some tasks manually, regardless of whether they own a wearable device. For example, some people are may uncomfortable using their wearables for tasks such as making a payment. “I think people would much prefer to pull their credit card out of their pocket and do it that way,” Pope said. In such cases, using a wearable isn’t as feasible or convenient as using a credit card or cash. In the future, upgraded functionalities – for example, one-touch payment methods such as Apple Pay or voice command systems – may make complex tasks such as making payments more convenient on wearable devices. Some people may find it too risky to access personal records or information on a wearable device. Downloading applications on a wearable device, particularly apps that track activities, records, or finances, opens access points to personal data that malicious actors can exploit. Wearables owners recognize the privacy concerns associated with their devices. Half of wearables owners (50%) believe their personal data is shared across multiple connected devices. Half of wearable owners (50%) believe their personal data is shared across multiple connected devices. This recognition means that wearables owners understand that certain information, such as financial records, may be accessible across multiple devices. In response, they avoid the risk by not using their devices for certain tasks. People connect their wearable devices to their smartphones. Over 90% of wearables owners download and access the same applications on their wearable devices as their smartphones. Only 6% of people connect their wearable devices to the same applications they use on other connected devices. To accomplish complex tasks such as controlling smart home appliances using a wearable device, people need to download certain applications. For example, to control a smart fridge using your wearable device, you need to download its application. Without that connection, wearable devices can only accomplish few core tasks, rather than function as part of the internet of things. Wearable devices do not move the needle on IoT investment. Over half of people (52%) who own wearables don’t plan to invest in an IoT device over the next year. Wearable device owners who do not plan to invest in other IoT devices over the next 12 months demonstrate that wearable devices have yet to boost the appeal of consumer IoT technologies. Specifically, people still need to embrace the idea of creating networks of devices that they can use to control their daily lives. People’s motivation for purchasing wearable devices is to accomplish a specific task such as tracking fitness and exercise, not to connect different parts of their lives. “If a person doesn’t do a lot of sports, he or she probably won’t be buying any wearables,” said Pavel Shylenok, CTO of R-Style Lab, a development agency based in San Francisco. People miss some of the main benefits of connecting wearable devices. As such, there is little consumer motivation to buy devices for purposes other than for their core functions. It’s not all bad news for the future of wearable devices. In fact, some passive uses of wearable devices provide benefits that can save people’s lives. Jason Perlow shared how his Apple Watch saved his life in a column for ZDNet. Perlow admitted that he purchased his wearable device to “get in on the wearables thing.” After wearing it for a short time, however, he received an update on his device that indicated it had detected an irregular heartbeat. After consulting a doctor he was diagnosed with Atrial Fibrillation, or afib, an irregular heartbeat. Although a doctor had previously measured his heart, the results only tracked one particular snapshot in time. Smartwatches and fitness trackers, on the other hand, are able to take prolonged measurements of people’s health. The benefits of health monitoring span the life of wearables device owners, said Pope. This includes monitoring children in their cribs and providing emergency care for the elderly. The health benefits of wearable devices can make them worthy investments. Wearable devices are the most visible consumer IoT technology, yet the second-most commonly owned IoT device behind smart home appliances. Smartwatches or fitness trackers are the most popular forms of wearable devices, and their popularity corresponds with the most popular brands in the wearables market: Apple, FitBit, and Samsung. Apple is the most popular brand of these devices as a result of its cultural capital and existing customer base. Wearable device owners mainly use their devices for legacy functions, namely tracking fitness and the time. More complex tasks such as managing finances or controlling home appliances are complicated by wearable's small user interface. 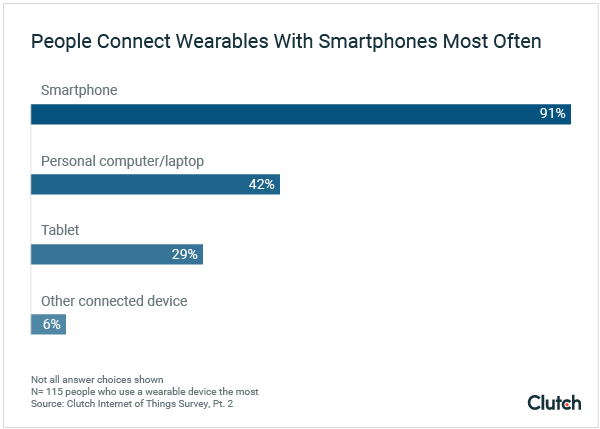 Nearly all wearables users sync their smartphone to the same applications as their wearable devices, but very few connect them to other IoT devices. The fewer applications a device is connected to, the more limited its functionalities. While people benefit from using wearable devices for limited functions, particularly passive health monitoring, people do not plan to invest in additional devices in the near future. Clutch surveyed 503 people who own a connected device to learn about how they engage with IoT technology. Thirty-five percent (35%) of respondents own a wearable device. Just over half (53%) of wearable device owners are male and 47% are female. Wearables owners were widely distributed in age: One-third (33%) are ages 18-34; 34% are 35-54; and 27% are ages 55 and above. Six percent (6%) are ages 13-17.